UPDATE: The next day, Mom and I decided to go back to try a Kozy Nook breakfast. I ordered the biscuits and gravy ($4.99), while Mom ordered the Kozy Nook special ($4.99), which consists of three pancakes, three eggs, and your choice of bacon, ham, or sausage. Dawn was our waitress, and she was very friendly. The breakfast was just as good as the lunch, but we did notice that a soda I had ordered during the middle of the meal was left off of our bill, just like the clam cakes had been the day before. Even so, we can't wait to return! I was able to capture this shot of the second dining room. Check out that high ceiling! Mom and I hadn't been to the Kozy Nook since it moved from inside the Westport Plaza to its own building in the same lot, so I was glad when Mom suggested that we have breakfast there before we embarked on a busy day of Christmas shopping. We pulled into the large parking lot at around 12:30 p.m. 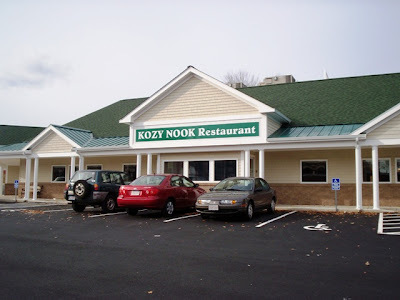 Unfortunately, once we stepped inside Kozy Nook, we noticed that breakfast is only served until 11:30 a.m. For some reason, Mom had thought that it was served all day. I asked her if she wanted to go elsewhere, but she said that she was interested in lunch. 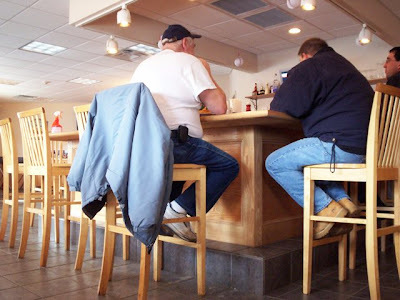 A hostess wearing a green Kozy Nook shirt greeted us and led us to a booth close to the bar area. She left two menus on the table with a list of daily specials and informed us that our waitress would be right over. Both Mom and I commented on how remarkably clean everything was. The walls are painted a bright white and the bar and booths are made with a very light wood. 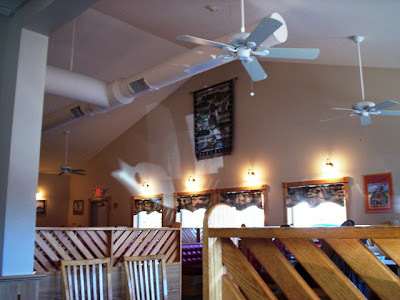 The sun was shining through the windows topped with country curtains that surround the building, while a large flat screen TV hung above the bar where a few local diners had gathered and were perched upon the high bar stools. 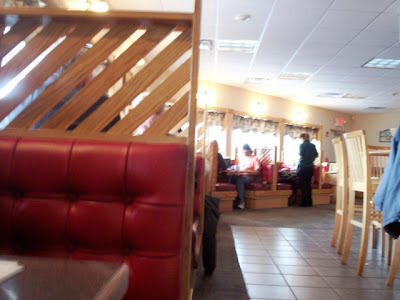 There seemed to be only booths at the Kozy Nook, but they were very roomy and comfortable. Aside from the Christmas decorations the staff had put up, the walls of the restaurant feature local art, photographs, and colorful advertisements. You could tell that this restaurant was definitely the hot spot for the latest in Westport gossip. While Mom and I were reading the menu, we were greeted by our waitress. Her name was Emmy, and she quickly took our drink order - two Diet Cokes. She returned with the Cokes in plastic glasses while Mom and I asked for another minute to decide what we wanted. When we were ready, Emmy returned to the table. Mom ordered the French meat pie ($6.99) which came with her choice of veggie and potato. She chose corn with mashed. I ordered a cup of kale soup ($1.79) and a tuna melt ($5.49), which came with fries. Emmy took away the menus and told us that our food should be right out. A few minutes after she walked away, Mom had remembered that she wanted to order a half dozen clam cakes. She managed to flag down Emmy, who was quite busy with all the customers that had packed into the dining area. 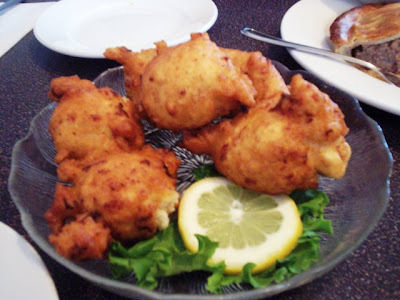 The order was placed for the clam cakes ($2.99), and Emmy told her that she would try her best to have them come out at the same time as our meal. For a small restaurant, the Kozy Nook definitely has a lot of choices. Appetizers range from a stuffed quahog ($2.49) to a platter of super nachos with chili ($7.99). Their featured appetizer is the chicken quesadilla ($6.99), which is seasoned chicken in a warm flour tortilla with a blend of melted cheese, bell peppers, and onions, served with sour cream and salsa. Burgers and sandwiches, all served with fries, include the "Big Daddy" burger ($6.99) which is a 10 oz. Angus burger grilled to order and served with lettuce, tomato, and onion on a soft bun. The sandwich list also features a boneless buffalo sandwich ($5.49), and a chourico and chip sandwich ($6.99). A little different for this sort of restaurant, the Kozy Nook also serves pizza. All pizzas are made on a 12" crust, and gourmet versions include the vegetarian ($8.99), meat lovers ($9.99), and chicken broccoli Alfredo ($8.99). 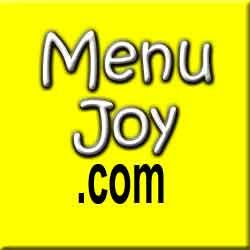 You can also opt to create your own pizza starting at $6.49 each. 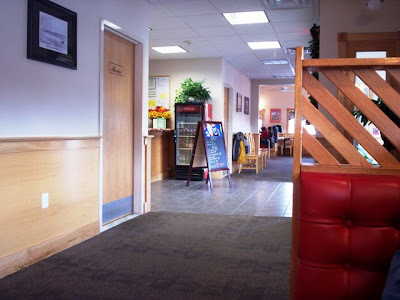 The Kozy Nook also serves pasta and seafood dishes, such as the linguini and white clam sauce ($9.99), the fish and chips ($8.49), and the shrimp scampi ($10.99). Also featured on the menu is a chicken stir fry ($6.99), which consists of chicken tenderloins and fresh veggies in an oriental stir fry sauce served over a bed of rice. It seems that the main attraction at the Kozy Nook is their home cooked favorites. Each favorite is served with your choice of potato and vegetable. Choices include the sirloin tips ($8.99), country fried steak ($7.99), Ma's meatloaf ($7.99), roasted turkey dinner ($7.99), and the boneless fried chicken ($6.99), which is tender chicken hand-dipped and fried to a golden brown. You can add a side salad to any home cooked favorite, pasta, stir fry, or seafood dish for only $1.99. A dessert menu features goodies like the chocolate ecstasy ($4.49) and the freshly made Kozy Nook pies ($2.99). Breakfast, which is served until 11:30 p.m. daily, include items like omelets, pancakes, breakfast meats, sandwiches, and steak and eggs ($6.99). Gift certificates are also available at the Kozy Nook. My soup arrived first. 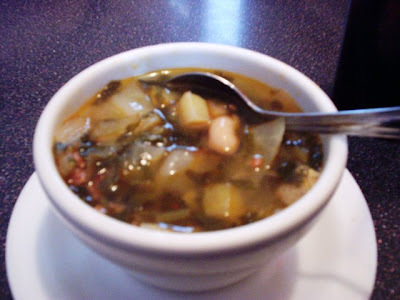 It was delicious and consisted of quite a lot of kale, beans, potatoes and chourico. It was very hot and satisfying - a perfect mixture of spice with a savory taste. It didn't take long for our entrees to arrive. Mom's French meat pie was an excellent choice. It was very meaty with a nice, flaky crust. The slice of pie was thick, and was a spicy combination of beef and pork. It was served with a good portion of real mashed potatoes, which were also delicious. The corn came in its own little dish, and was served nice and hot. 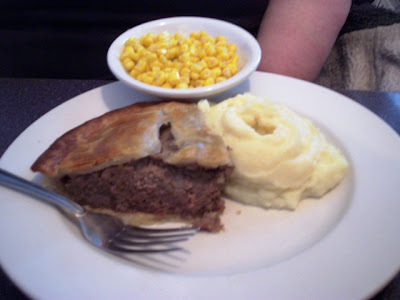 Mom said it was one of the tastiest meat pies that she has ever had, and she would definitely order it again. She highly recommends it! My tuna melt was great. 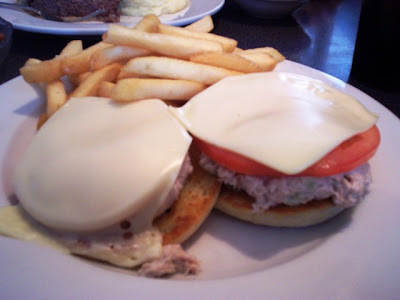 It was served on an English muffin, and on each half of the muffin was a scoop of tuna, a slice of tomato, and a piece of cheese. At first, I didn't know how to eat it. Mom told me to just pick it up and put it in my mouth, but it just seemed wrong. I finally decided to eat it with my knife and fork, and boy was it good. The tuna was fresh, and so was the cheese and tomato. The English muffin really held it all together, and the fries were excellent and tasted homemade. The clam cakes did end up arriving with our entrees. Served with some greens and a lemon, the clam cakes were very tasty and full of clams. The cakes were not greasy at all, and each one had a very nice crust. We left $25 on the table for Emmy and headed for the door. As we left, there was a young girl who was painting a Christmas scene on the outside windows. I should mention that during the beginning of our visit to the restaurant, I used the restroom. It was immaculate. For a small restaurant, they really have an advanced facility. It was spotless. I think that the Kozy Nook is a fantastic place to go if you want home-cooking for a reasonable price. The staff is friendly, the interior is very clean, and the atmosphere is a welcome change from the hectic chain restaurants in the area. Kozy Nook is open from 6 a.m. to 9 p.m. Monday through Thursday, 6 a.m. to 10 p.m. on Friday and Saturday, and 6 a.m. to 1 p.m. on Sunday.